Retirement Party Catering With Hog Roast Anglesey! At the end of 2018, Joanna decided it was finally time for her to retire and thought that she would have her leaving do in the New Year after finishing work before Christmas. She had worked at the company for over thirty years it was finally time for her to say goodbye. However, Joanna wanted to go out with a bang and decided to hire the Hog Roast Anglesey team to celebrate with her work friends. After arranging a venue, she arranged a DJ to give her former colleagues a reason to dance. Joanna had made many long term friends at the company and many of her colleagues arrived with gifts and cards to wish her a happy retirement. Once the party was underway, the Hog Roast Anglesey team arrived and set up outside, beginning to prepare their brilliant fresh food. They cooked a classic hog roast menu for Joanna’s guests consisting of a whole slow roasted hog served with apple sauce, homemade stuffing and the team’s classic crackling. The meat was served in bread rolls and accompanied by a vegetarian friendly option. As the guests enjoyed their Hog Roast, the team ensured that there was plenty for everyone to have second helpings. 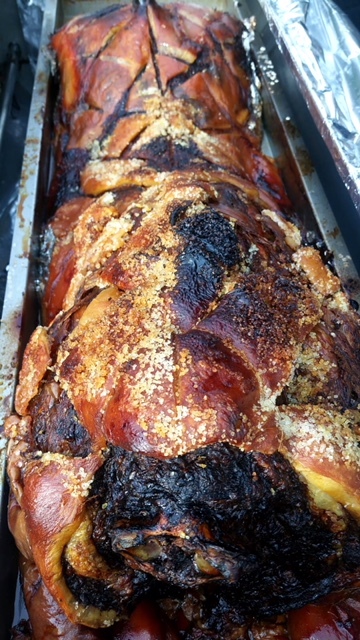 The team’s head chefs worked tirelessly to ensure that all of the meat was cooked to perfection and the food was of the highest quality to meet to usual high standards of the Hog Roast Anglesey team’s food. The team also ensured that the meat was deliciously tender and filled with lots of flavour when the guests were ready to eat the buffet. The team also kept the meat warm but ensured that it did not dry the meat out and leave it tough. This makes the Hog Roast Anglesey team a brilliant addition to any long event as they can keep the food on hold and ready to serve whenever your guests are ready. Joanna was pleased that her guests had had a fantastic night and were very happy with their catering. The party was a great way to end her time at the company and all of her colleagues had a great time celebrating this with her. A Surprise 70th Birthday To Remember With Hog Roast Corwen!